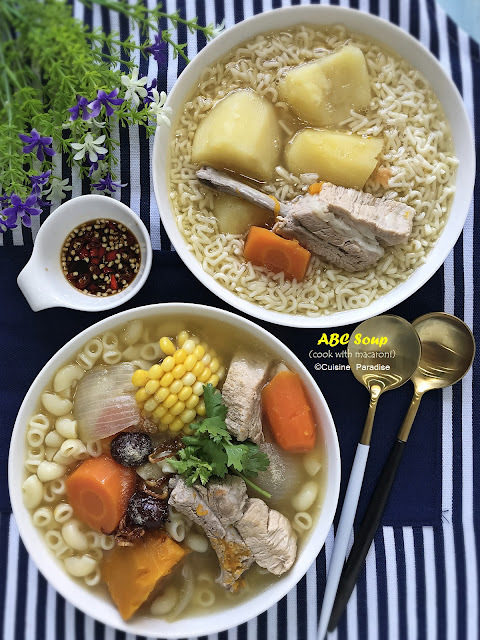 Since having "mala xiang guo" can be quite costly sometime because the vendor actually charged separately for vegetable and meat items so ou might as well prepare it at home. What you need is just a pack of pre-mixed sauce which you can easily grab from supermarket. 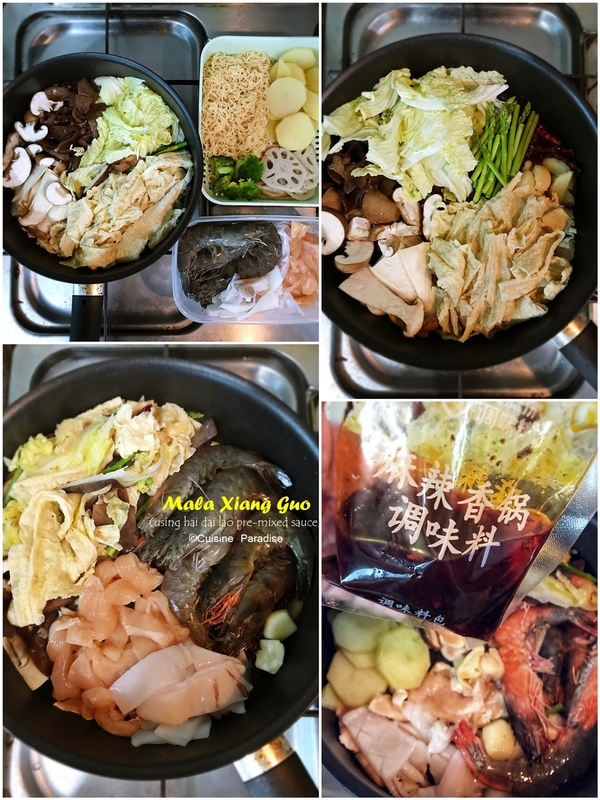 In this recipe I am using Hai Di Lao (海底捞) basic stir-fry sauce together with some of our favorite ingredients listed below. 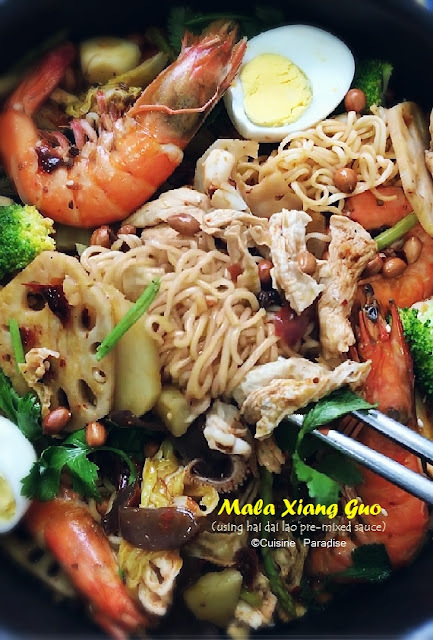 Watch how we prepared this quick and easy Mala Xiang Guo. 1. Simmer potato and lotus root in salted water for about 5 minutes till potato slightly soften. Remove and rinse with water then set aside. 2. Next cooked instant noodle and glass noodle accordingly to packet instruction, rinse and set aside. 3. 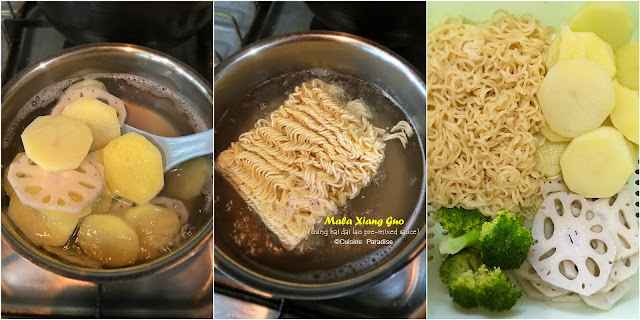 Drizzle some oil in a hot skillet (or you can prepare the ingredients separately according to the size of your pan) then arrange vegetable ingredients such as cabbage, mushrooms, beancurd stick, asparagus and 2 slices of ginger then simmer for 2 minutes. ALTERNATIVELY you can choose to blanch the vegetables in boiling water for a minutes, remove and set aside. 4. Push the vegetables to one side of the pan; add 1 teaspoon of oil follow by garlic, ginger and dried chilli then saute for 20 seconds till aromatic before adding prawn, squid and chicken. 5. When the prawns almost cooked through, combine all the ingredients together except noodles. Next stir in a pack of Hai Di Lao stir-fry sauce then let it simmer for 20 seconds before adding in hot water. 6. Lastly add in noodles, mix well and let mixture simmer for a minutes to adsorb the flavour. 7. Garnish with peanut, sesame seeds and chopped Chinese parsley and serve immediately on its own or with steamed white rice. Above is a sample of the basic stir-fry sauce from Hai Di Lao (海底捞) which I bought it from local supermarket. 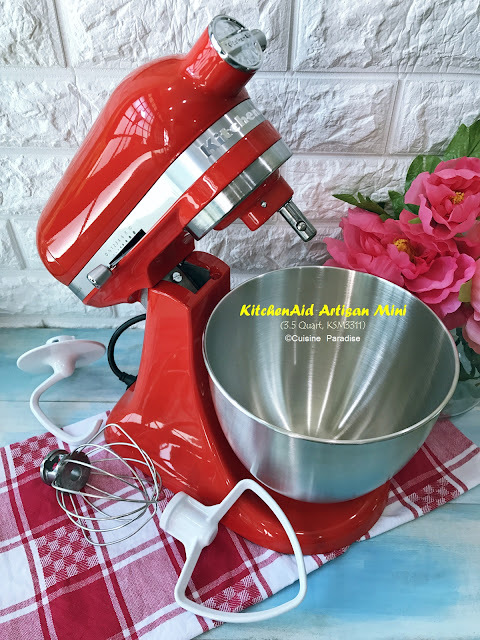 It comes in 2 small packs (110g each) which you can use to in 2 separate cooking. Beside this basic sauce, they also have hotpot soup base such as tomato, seafood, mushroom and etc.